The pilots flew out of the San Diego airfield, once home to the Navy's "Top Gun" flight school. Two U.S. Marine Corps aviators are under investigation after a recent flight path over Southern California amounted to an obscene image. The phallic image was reported in late October by the Twitter account Aircraft Spots, which states that its purpose is to track military aircraft. The data pattern was made over the Salton Sea in California's Colorado Desert. The account's initial misidentification of the flight as a U.S. Navy operation earned a swift response from the U.S. Naval Air Forces' official Twitter account: "The aircraft in question is not a U.S. Navy aircraft." Aircraft Spots soon realized that it was a "USMC" plane, prompting reporters to reach out to the U.S. Marine Corps media liaison. It turns out the pilots onboard were flying out of the fabled Marine Corps Air Station Miramar in San Diego, once home to the U.S. Navy flight instruction school known as Top Gun — the basis for the eponymous movie franchise. Major Josef Patterson, spokesman for the Miramar-based 3rd Marine Aircraft Wing, said in a statement that the flyers were "being investigated for flying a pattern resembling an obscene image" and "are currently not flying pending the results of an ongoing investigation." 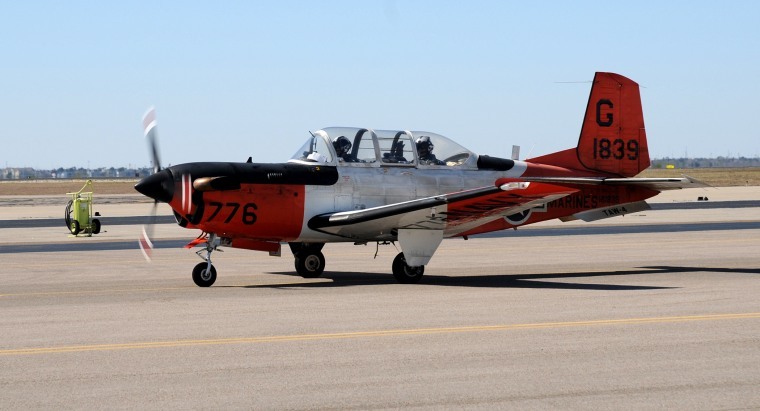 He identified the aircraft as a T-34C, made by Beechcraft. A pair of Navy aviators drew a similar image in the sky over Washington state last year by using what appeared to be smoke or vapor trails, according to NBC News affiliate KING in Seattle. That work also inspired a military investigation. In San Diego, the pilots under investigation have been grounded, but they still have jobs. "Although not flying for the time-being, the two Marine Corps aviators are still providing vital squadron ground support functions," Patterson said. "Disciplinary or administrative action, if any, will be determined following the completion of the investigation."